This is the Ford VIN help article in a series we will post on Vehicle Identification by AutomotiveTimelines Restoration Pro, Adrian Britton. If you have questions with the identification of a vehicle, you can contact Adrian at adrian@automotivetimelines.com, or post your question to one of the articles. You do not have to be a member to ask for help. 1908-1925 Model T Fords had only an engine number it was stamped on the LH side of the engine above the water intake. Ford did not start stamping numbers on frames until 1926. 1926-1927 Fords stamped their number on the top of the right side frame rail near the emergency brake cross rod. The frame number and engine number should match for 1926-1927 Model T.
Look on top of the frame on the left side back from the front body bolt hole. This is where you would typically place your left foot. Many engines were replaced on these early Ford’s so be sure to match up any number found with that on the engine block. The engine number is stamped on the LH side of the engine above the water intake. 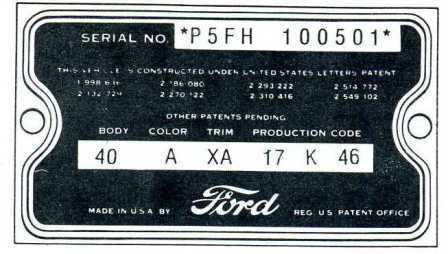 From 1932 through 1948 vehicles, Ford Motor Company stamped the serial number into the top of the driver’s side frame rail in three locations. This same number was also stamped into the top of the transmission-to-engine housing portion of the transmission on V8 engines and L6 engines. This location was visible when the floorboard and transmission cover plate were removed. On 4 Cylinder engines the engine number is stamped on the LH side of the engine above the water intake. Of the frame-stamped serial numbers, only the forward-most stamping was visible when looking down into the engine compartment located between the front cross member and the dash (firewall). The two other frame locations are visible only when the body is removed from the frame. The serial numbers were metal stamped with numbers/letters approximately 1/4″ in height. Look inside the frame rail, driver’s side. The number (including the prefixes shown) was always preceded by (and followed by) a stamped “star” similar to an asterisk. It is believed that this was done to prevent someone from fraudulently adding a digit to the beginning or ending of a serial number in order to alter its identification. Starting in 1931 Ford changed the numerals for 1, 6 & 9. Click on the image to see a larger view that will also allow you to cycle through all the photos in this article. A number should be stamped in the topside of the right frame roughly in the area below the heater fan and should match the data plate tag on the firewall. There is no number stamped on the engine. This is a 1955-1956 Thunderbird data Tag. This is a 1957 Thunderbird data Tag. A number should be stamped in the location shown below by year and should match the data plate tag on the firewall. There is no number stamped on the engine. During the first few years of production, 1964 1/2 to 1967, look on the upper flange of the left front fender apron which is under the hood. AutomotiveTimelines Members can also find resources in our Library to help with identification, like this vintage Ford Motorcraft Shop Tips magazine, that shows how to read VIN plates on 1968 – 1974 Ford products. How to read Ford VIN Plates on 1968 – 1974 Ford cars and trucks, Lincoln, and Mercury. We will add links to the VIN articles as they are posted to the website for easy navigation, or you can use the tools on the right sidebar to locate articles if you prefer.